Bill Wren of the McDonald Observatory in Texas receiving the Hoag-Robison Award from IDA Board President at the IDA 2015 Annual General Meeting. Every year volunteers from around the globe show remarkable dedication and initiative in supporting the IDA mission. The IDA awards program recognizes individuals who have given generously of their time to dramatically improve our nighttime environment. The following amazing individuals and organizations were recognized at our 2015 Annual General Meeting held November 14-15, in Scottsdale, Arizona. A detailed description of each award can be found on our Awards page. Bill was recently featured on the CBS News “Sunday Morning” program, in which he was referred to as “the Angel of Darkness” due to his efforts to protect the night skies of west Texas, one of the darkest spots on the globe. For the past 20 years, Bill has strived to control light pollution by working with city councils, county governments, utilities, media representatives, and businesses across west Texas and beyond. His tireless efforts have raised awareness and helped protect the entire region. He has made continuing astronomical research possible at the McDonald Observatory, defending millions of dollars of investment. In addition, he has preserved the night skies for the general public. Due to his outstanding work, many laws and zoning rules have been updated to protect the nighttime environment for future generations. Bill has set a high standard for all of us, and his outstanding dedication to night sky preservation is unheralded. For years, Andreas has been actively fighting light pollution in Germany and Europe and was a key player in the designations of two International Dark Sky Reserves in Germany – Rhön Biosphere Reserve and Westhavelland Nature Park. Establishing a Dark Sky Reserve is much more difficult in Germany than in other countries because it requires obtaining agreements from numerous mayors from dozens of small villages. Andreas meticulously persuaded local councils in both cases to adopt meaningful limits on their outdoor lighting for the protection of the reserves’ core regions. In the spring of 2015, he was co-awarded the “Grüne Palme” (Green Palm) award by a German magazine similar to National Geographic in the United States. Andreas holds a Ph.D. in Astronomy and is involved in the light pollution research efforts of the Loss of the Night Network, a part of the European Union Cooperation in Science and Technology (“COST”) Framework Program. He is also the Dark Skies section head for the Vereinigung der Sternfreunde, the largest association of amateur astronomers in Germany. Henryka, an undergraduate student from Poland, created an improved version of the 1976 model developed by Richard L. Berry that uses not only population data but also dasymetric methods to map population density relative to residential land uses. She used this to successfully model light pollution over Poland and traveled to Canada to present her work at the 2015 LPTMM conference, where it was well received by participants. The light pollution project of these sixth grade students from North Attleborough, Massachusetts, was awarded second place in the 13th Annual eCYBERMISSION Student Challenge Competition, an Educational Outreach Program of the U.S. Army. In an effort to reduce light pollution in North Attleborough and surrounding towns, the team designed a light pollution reducing shield for the streetlights in their community. The shield was made from recycled cans and the North Attleborough Electric Department installed it on a streetlight near the team’s residence where they could measure the amount of light reduction compared to a control streetlight and analyze their data. Since 2006, Jou has worked with students on organic LED (OLED) lighting technologies in an effort to create lighting that minimizes negative impacts to human health. In this work, he and his research team has made numerous breakthroughs, such as the creation of very low color temperature OLED, sunlight-style OLED, pseudo-natural light OLED, and candlelight-style OLED devices. Their candlelight-style OLED has attracted a considerable attention from both academia and industries. Most importantly, the candle-like OLED has also been praised by medical experts and is considered one of the safest electricity-driven lighting sources. This lighting can be used in both both indoor and outdoor applications. Jim Bradburn, Steve Linderer and Ed Stewart (Wet Mountain Valley Dark Skies Inc.), for their light pollution reduction efforts over many years, resulting in the designation of Westcliffe and Silver Cliff, Colorado as an International Dark Sky Community. Rémi Boucher and Guillaume Poulin (ASTROLab at Mont-Mégantic Observatory), for their work at the Mont-Mégantic International Dark Sky Reserve in Québec, Canada, and use of nighttime photography to highlight and promote the protection of dark skies in the area. Sabine Frank (Project Coordinator, Rhön Biosphere Reserve), for her efforts in getting the reserve designated an International Dark Sky Reserve and her continued work promoting dark sky friendly lighting in central Germany. Joanne Kendrick (Keep Sedona Beautiful), for her successful efforts helping Sedona, Arizona, become an International Dark Sky Community and current efforts to get IDA designations for nearby Big Park/Village of Oak Creek and Red Rock State Park. Keith Krueger (Superstition Mountains Astronomical League and chapter leader of IDA Pinal County), for his years of work educating the public about light pollution in the Phoenix, Arizona, area. In 2005 he won the an IDA Executive Director Special Award. Pie Town Rising Stars (a new nonprofit in Pie Town, New Mexico), for its commitment to preserving the area’s dark skies through public outreach. Jim Traweek (San Diego Astronomy Association and IDA San Diego), for his ongoing efforts educating the public about light pollution in the San Diego, California, area. Diane Turnshek (Carnegie Mellon University Department of Physics), for her help protecting the night skies over Pittsburgh, Pennsylvania, and surrounding areas and her public outreach efforts, including a presentation at TEDx Pittsburgh. Eric Vandernoot (Astronomy and Physics Lab Coordinator, Florida Atlantic University), for his dedicated efforts helping to organize the Annual Dark Sky Festival in Palm Beach County, Florida; his tireless public education talks; and public outreach efforts through his light pollution resources webpage. 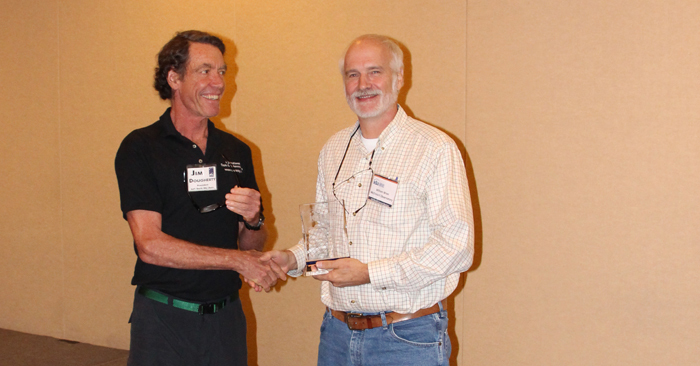 Mike Weasner (Oracle, Arizona), for his efforts in helping the Oracle State Park become an International Dark Sky Park; his work helping other Arizona state parks start the Dark Sky Park application process; and for championing dark skies in Pinal County, Arizona. Bob Yoesle (Friends of Goldendale Observatory), for his work helping the observatory in Washington state obtain an International Dark Sky Park designation and his continued efforts working with the city of Goldendale, Washington, and surrounding Klickitat County on the long-term protection of the Dark Sky Park.